In Scotland, William Grant & Sons produces the world’s most popular single malt whisky – DB SCHENKERbeverages is responsible for handling the logistics from Glasgow throughout the globe. A cold wind whips across the cornfields and up the hills. Strangers coming to Girvan in the winter, collar upturned, are usually on a quest for gold. Their search takes them to a hill towering above a bay, in the midst of which lies Ailsa Craig. Across from the craggy island sits the Girvan Distillery, its chimneys shrouded in mist and its black warehouses rising up over the ocean. This is where William Grant & Sons (WGS), known the world over for their whiskies “Glenfiddich” and “Grant’s,” store whisky and gin in around 1.5 million oak barrels. The Girvan Distillery is one of two Scottish locations where WGS produces its “spirit,” as the high-proof distillate is known. As Technical Director of the distillery, Alun Borland is something akin to a custodian of liquid gold. At the same time, some 8,300 kilometers away on the far coast of the Atlantic, palm trees on white sandy beaches sway in the warm breeze. Like many other Latin American countries that have witnessed a rapid economic growth, Panama is also experiencing a thirst for exclusive whiskies – preferably of Scottish origin. This is where Peter Burnside enters the picture. As ­Account Manager for DB Schenker and specialist in the transportation of wines and spirits, he is responsible for organizing the logistics behind William Grant’s whisky exports. For just as it does for all other beverages, DB SCHENKERbeverages also provides tailor-made complete solutions for spirits such as whisky. DB Schenker’s global network not only guarantees smooth handling during transport but also offers services such as pick & pack, repacking as well as continuous transparency through electronic warehouse management. Added to this is the company’s long-standing experience, which can provide a vital edge particularly when it comes to the documentation associated with transportation in the spirits industry. 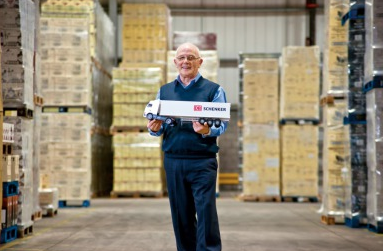 The groups headed by Burnside and ­Borland operate as a closely meshed team in distributing this spirit throughout the world – even to Panama, where DB Schenker recently established its own subsidiary.